Creating stained glass is a highly skilled craft with a long history in the arts. The term "stained glass" is used to describe both the glass itself and items made from this richly colored material. Stained glass items are commonly constructed using small pieces of glass with copper foil edges fused together and held in rigid leaded came frames. Familiar examples of this technique include church windows, sculptures, night lights and Tiffany glass lamps that come to life when illuminated with light. Stained glass can also be painted with colored stains that are fused to surface with heat. Artworks created from stained glass have been produced for more than a thousand years. The origins of this technique may have started with artisans working with mosaics, cloisonné or jewelry. 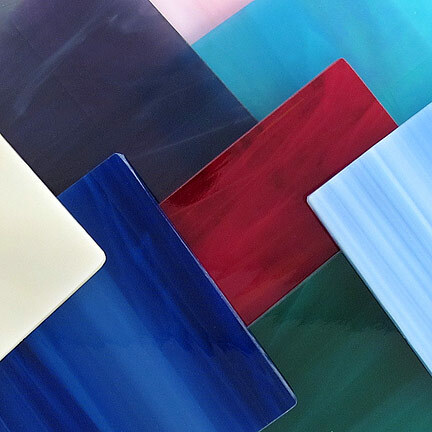 Production Process: The rich colors found in hot rolled stained glass are created by adding metallic salts to the glass during the manufacturing process. The heated glass is poured out during its molten stage and rolled into a flat sheet. As a result of this process, art glass is highly textured with occasional variations (waves, streaks, bubbles, etc.) in the surface, as well as clear and translucent areas within any piece of glass. The special look and depth of color created using this technique make every piece of glass unique. These random variations should be considered a natural and desirable part of the finished product. Iridescent Glass: Our stain glass has an special iridescent coating with colors like that of a soap bubble. The iridescent colors vary across the surface, shifting as the angle of the glass changes. No two pieces of glass are exactly alike making each gift unique. Kyle Design uses traditional stained glass in creative ways to take advantage of its special qualities. 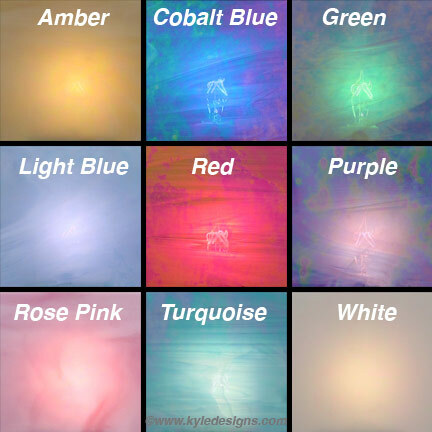 The wispy translucent colors allow diffused light to shine through when used on decorative night lights and sun catchers, and give the variegated color depth when used on personalized jewelry boxes. Gifts are offered in a choice of nine gorgeous stained glass colors: amber, cobalt blue, light blue, green, turquoise, red, rose pink, purple, and white.